There are some exciting things happening in Chef Certification right now. If you dipped in previously and haven't progressed, then you should come back to check it out. Before you do, here are some highlights of the changes. If you've sat Local Cookbook Development or Extending Chef exams, you'll know that the Multiple Choice and Lab components of those exams are separate and you must pass Part 1 before you can schedule Part 2, and you must pass both components to obtain that badge. Well all that's about to change. Going forward all badges will be one single exam which will cover both multiple choice as well as hands on tasks. This is an exciting new development for us, and it means we can include multiple choice questions based on a live environment, like, "Use knife to find the IP Address of the node with role[database]" and have the actual IP as one the multiple choice options. How cool is that? And there's more. In moving to this new format the Local Cookbook Development and Extending Chef exams will now be open book. Yes, you heard that right – open book! You will have full access to Chef documentation during the exam, just as you would in real life when solving a problem. But there's a catch, we will be limiting the time for completing an exam to 90-minutes. So you may be able to look up one or two things, but you won't have time to look up every answer. And watch out, since you can look up the docs, we may include some situational based problems for you to solve, and more difficult questions. One of the most frequently asked for features is a certificate for each individual badge that can be shared on LinkedIn. Well guess what? We've listened to the feedback and we're doing it now. As of now, anyone who passes an exam will get a certificate for that badge. We will go back and update the accounts for anyone who obtained a badge up to now, so look out for an email coming through. 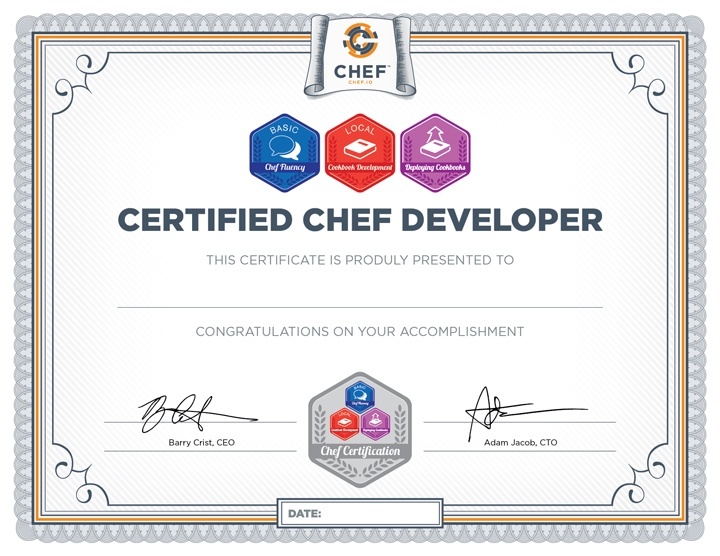 Of course, you'll also get a separate badge for the actual Certified Chef Developer certification once you obtain three badges. Another common request is to have a Windows equivalent exam for Local Cookbook Development. Up till now the multiple choice questions have been platform agnostic, but for the hands on part you were given an Ubuntu workstation and asked to perform linux-based tasks. We fully understand this is less than ideal for Windows users, so now we're addressing it. Now, when you schedule a Local Cookbook Development exam, you will be asked if you want to use the Linux or Windows variant. In both cases, the multiple choice questions are platform agnostic, but now the Windows version will ask you to perform Windows related tasks in a Windows environment. One other popular question is, "do you have any sample questions so we know we are ready to take the exam?" Well the truth is we don't have sample questions, but we have gone one better. Instead, we're giving you a bunch of tasks you can work through in your own time on Learn Chef Rally. Check out the new Chef Certification Prep track! Learning Chef is one thing, but getting real, practical, hands on experience is something different entirely. Tutorials are great to help you learn, but they don't force you to think about the solutions. If you want to become a Certified Chef Developer, then you really ought to be able to complete these tasks. Use them to gauge if you're ready to sit the exam, and also to get some real hands on experience. In celebration of all the changes for Chef certification, we're offering a 25% discount on all exams purchased through October. Go to https://training.chef.io/certification to schedule your exam and use the discount code "CERT25" at checkout. The post What's new in Chef Certification 2.0 appeared first on Chef Blog.